We doubt NextGen Gaming could foresee the popularity of this game when they first created the beautiful and adorable Foxin’ Wins pokies, but this glorious gem fast became a huge player favourite. 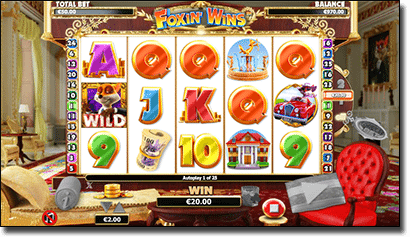 Using cinematic grade animation, crystal clear HD graphics and characters so cute you just want to punch your screen, Foxin’ Wins is the prime example of where Internet pokies are headed, with NextGen leading the pack. Foxin’ Wins follows the charmingly aristocratic fox and his battles as he tries to catch a naughty leprechaun. The game is set against the fox’s house (or more accurately, mansion) with symbols made up of pleasures from his lavish lifestyle. 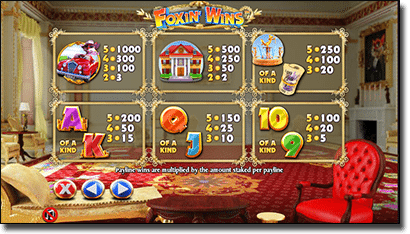 Foxin’ Wins is available for free play in practice mode or for real money at G’Day Casino. G’Day is one of our favourite virtual pokies venues as it offers reliable, secure payment methods via a range of options. New users benefit from the welcome bonuses that G’Day has to offer, which include 100% matched bonus on all deposits and 50 free spins on popular pokies. Once you’ve taken Foxin’ Wins for a spin, G’Day also houses the sequel, Foxin’ Wins Again. Foxin’ Wins can also be found for play in real money at Slots Million, so why not take advantage of various welcome offers by signing up with a few different sites. This 3D masterpiece consists of five reels played over 25 pay lines and utilizes state of the art graphics and sounds to provide a fabulous gaming experience. There are the chance for some awesome bonuses, with excitement around every corner. Scatter symbol – the scatter symbol is a pot of gold. Hitting three or more scatters will activate the bonus feature, as well as earning you ten free spins with each win doubling your original bet. Wild symbol – the wild symbol is the noble fox himself. The wild substitutes for all other symbols except for the scatter that can complete all winning combinations. Landing on five wild symbols anywhere across the reels will earn you an additional 2,000 coins for good measure. A fox pup may also appear at any time to run a symbol wild. Bonuses seem to fall out of the sky with Foxin’ Wins, and we sure aren’t complaining. The bonus rounds come at random and are fun, cheerful and provide the chance for some serious wins. Free games – free spins are activated when the scatter symbol (pot of gold) appears three or more times anywhere over the reels. During these free games fox pups will appear more frequently and all prizes are doubled during any free spin. The free games feature can be re-triggered again during free spins. Fox Funds – this is a totally random bonus that may strike at any time after a paid spin. The game insists that “foxes are generous creatures” and sometimes like to top up your balance with some Fox Funds out of the goodness of their heart. Who are we to argue with this kind generosity? Leprechaun Shakedown – this bonus is not only financially rewarding but the animations are just hilariously satisfying. Watch as the noble fox tries to catch the cheeky leprechaun and turn him upside down to shake him free of all his gold. The Leprechaun Shakedown is also activated at random, and once it’s triggered it will take you to a new screen where you attempt to catch the leprechaun. During this bonus round, prizes are only awarded if the leprechaun is successfully caught. 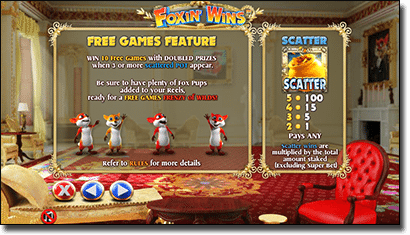 Ahhh Foxin’ Wins, what can one say about such a glorious game… There are many reasons this game soared so hugely in popularity and remains a player favourite, and it’s definitely up there on our list of most loved online pokies. The game is just so vibrant, the graphics so sublime, and the characters so endearing that Foxin’ Wins is impossible not to love. It’s a good light hearted game that is loads of fun to play, with cheerful colours and sounds that can really brighten up even the most miserable of days. Cute critters, great bonuses and striking graphics makes Foxin’ Wins an instant winner in our books. Play this NextGen gem for free or real money at Slots Million and experience for yourself the magic of the ridiculous world of upper class foxes and all their riches.